I was ready to give this book 4.5 stars before it even began, and certainly through the first five chapters. That’s when something changed. I was at first delighted by the amount of humor, which was equal the amount I was learning. 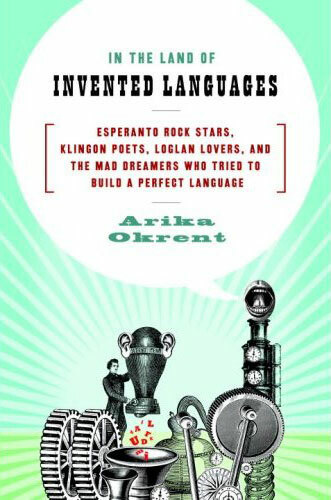 In the first few chapters, Okrent details the history of ambitious folks who tried their hand at inventing a language to solve the eternal problem of using a natural, broken language. The problem to be solved: words have double meanings, communication isn’t perfect. The assumption: a system can be invented so 1) everyone may say exactly what they mean, 2) the listener can tell just by word usage what the speaker is trying to say, and 3) ideally, the perfect system would be internationally understandable and adaptable, creating a perfect, universal language. Okrent is so fantastic at explaining why a perfect language cannot be made that I didn’t feel the need to continue on past the first 8 chapters. She explained perfectly why a Linnaeus-type system, while being the closest to functional, could never work—primarily that people don’t even know exactly what it is they mean to say to begin with, and that deciphering and translating is so painstaking that I inferred it was a miracle she even continued on with this idea. So perfect was her explanation, that when she proceeded to delve into all the ways and detailed examples of the failures of such a system, and continued on for quite some time, I couldn’t pick the book up again. Perhaps it’s my fault for not being the type that can skip sections in a book, ever. Okrent clearly spent a great many hours studying the topic at hand, but the expression of those hours was often unnecessary—again in regards to over-explanation of failed systems. I didn’t need 4 pages of the translation of two sentences using a nonviable system. I get it, it doesn’t work—I can clearly see why and how thanks to you, but don’t torture me. I get the impression that the rest of the book will continue to be overly ambitious. It would be majorly entertaining and educational, then suddenly dive into a directionless, laborious examination of a system that was already thoroughly explained. A chapter would end, and I wouldn’t know where we were headed. Overall, this book could have benefited from an index that outlined which chapters would grant you an understanding of what specific topic: such as Klingon-speaker culture, history of failed projects in which century, etc. rather than expecting the reader to read from cover to cover—because it really was all over the place with its ambitions. It would make a better textbook or blog. It was still worth borrowing, but I’m glad I didn’t purchase it as I don’t see myself getting through the rest if chapters are likely to pointlessly drone on after the lesson has already been delivered. Next Post National Puppy Day is a thing?! I like conlanging too. I just discovered it. That’s one of the things that I do on my blog. I try reading the book for myself.